The Seattle Mariners scored one run on Saturday night off of a second inning homerun from Dustin Ackley. That tied the score at 1 - 1. The first homerun for the rookie second baseman in just his second game since being up with the M's. 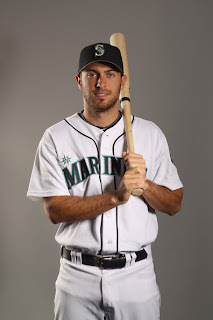 Ackley has one hit in each game and continues to put up some impressive at bats. Greg Halman had another two hits tonight as he holds a .440 AVG since coming up to the big club. Halman is a very strong candidate to take the left field spot once Gutierrez is playing everyday again in center. Halman has the best defense and the most speed of the trio of outfielders including Peguero and Carp and his bat seems to be doing quite well with the Major League pitching. Felix was cruising along after the first inning until the 7th when he ran into trouble. With 2 outs and the bases loaded, Shane Victorino dropped a shallow fly ball down the left field line that barely stayed fair and then bounced into the stands for a ground rule double. In the top of the ninth it was Victorino again that hit a two run homer off of Jamey Wright to make the score 5 - 1 and put the game on ice. Tonight was the first night that I can say our lack of defense really hurt us. Peguero is a decent player, but his abilities in left field are sub-par. I think Halman may have had that ball. In the grand scheme of things, it proved to not matter anyway after Wright gave up the two run bomb. Wright has been shaky as of late. So the Mariners fall in game two of the series but to make things worse, Texas won and put us back by a whole game to 1.5 games back in the AL West. We get so close to that first place mark that we can almost taste it, but we just can't seem to grab a hold of it. Tomorrow is the rubber match of the three game series versus the Phillies as the Mariners send Jason Vargas to the hill against Cole Hamels. If the M's continue their trend, they have the ability to hit Hamels around a bit as they seem to do better against higher odds. Felix, a victim of the lack of run support one more time. Let's bring out the sticks tomorrow M's.